It sure is. 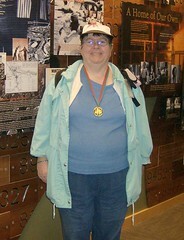 A former resident of Columbia Villa and current resident of New Columbia, Linda Dougherty recently won the gold medal for bowling in the Oregon State Special Olympics. Proudly wearing her medal around her neck, she explains how this prize became hers. I started bowling for fun in 1992, and I met a lot of people at Powell Lanes who did Special Olympics. I started doing that and found it really relaxing. The Special Olympics committee picks 100 people to bowl in the local tournament and the top people get to go to state. I took 3rd place at that local tournament. You get to bowl three games in the state tournament and thats where I got this, Linda said, beaming proudly. Linda looks forward to September, October and November because this is when she gets to go bowling.